I've been feeling a lot of tugging lately. This blog is still evolving, in my mind if not on the electronic page, and I'm just not sure which way I'll go with it! We were in Mandeville for Christmas. Logan and I were lucky to have both a night down in New Orleans with our good friend Robert as well as a full day there to ourselves. On selfish day, we wandered the streets, eating and drinking and admiring and shopping. It was really wonderful to get such a great date day with Logan! The day started with brunch at La Petite Grocery. Note - all these pics were taken with our new iPhone 5s's. The quality is SO much better than our old phones. It's even better than our point and shoot! Doesn't really compete at the same level as the 5D mkII, but it's maybe 1/20th of the weight. 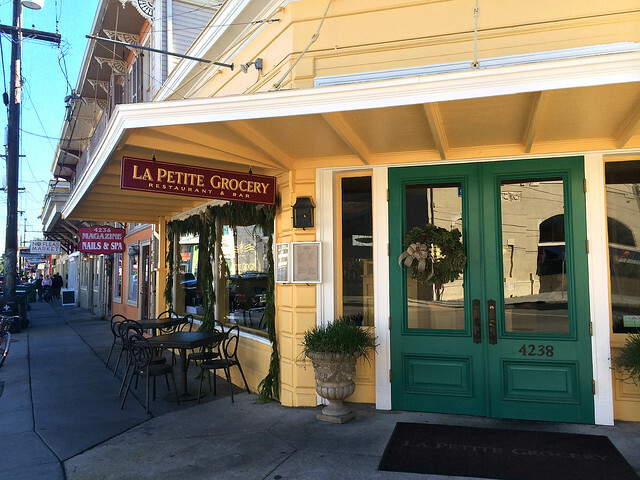 La Petite Grocery is on a lovely stretch of Magazine Street. Reservations are highly recommended, though we were lucky as a party of 2 to be able to show up and get seats right at the bar. 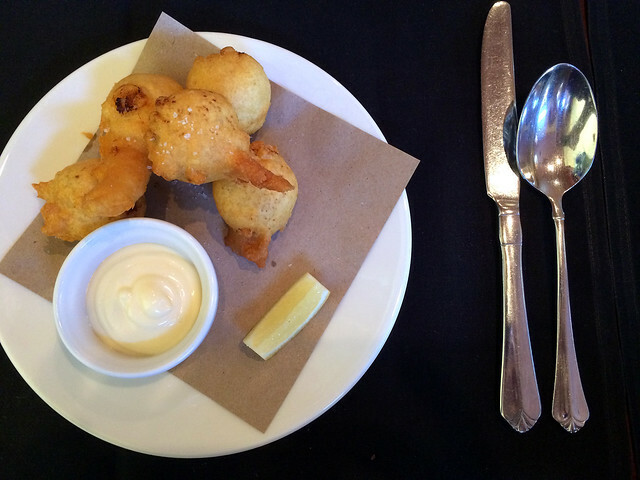 We started with an order of the blue crab beignets with malt vinegar aioli. These appear to be La Petite Grocery's most talked about dish, and OMG holy wow we can see why! Though usually when I think "beignet" in New Orleans I think "fried square of dough topped with powdered sugar", the word also apparently means "fritter". These had a perfect crunch on the outside and were deliriously creamy inside, with a filling almost like a crab béchamel. And why, yes, I DO have the recipe! Just in case you'd like to attempt to recreate the experience, La Petite Grocery provided blue crab beignet instructions to Bon Appetit. 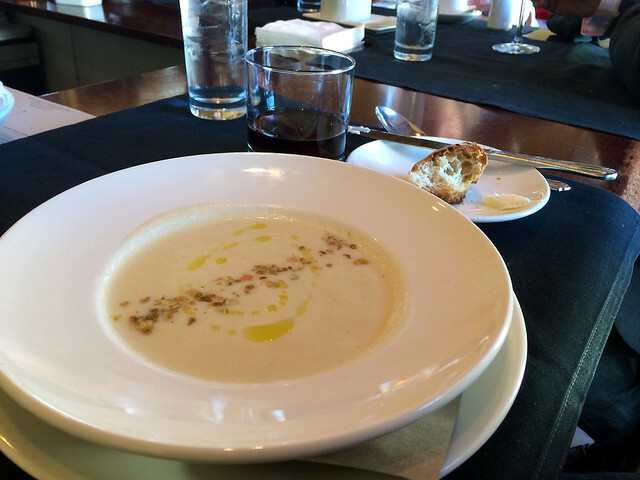 We also had an appetizer soup, the daily special, which was an über-smooth velouté of parsnip, cauliflower, and turnip. It was topped with a beautifully angular sprinkling of toasted pumpkin seeds and a swirl of (olive? I forget) oil. So good. There was a nice, muted bite of turnip, backed by cauliflower's earthiness and the spice of parsnip. Of course they provided us with nicely crusty bread and spreadable butter. 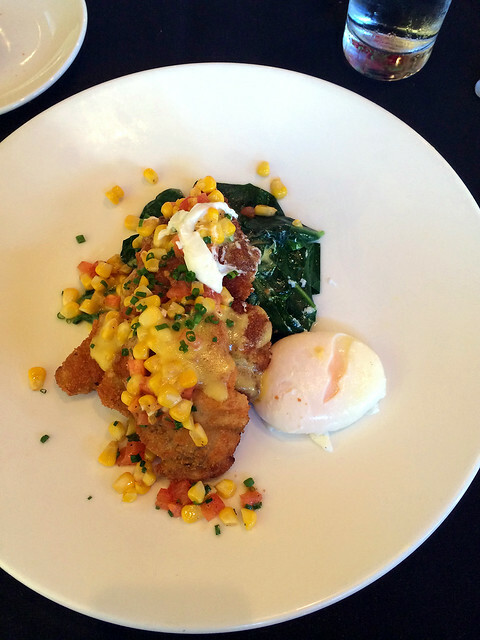 Second course was their panéed rabbit with a tomato and sweet corn compote, collard greens, and bacon hollandaise. We added an egg, because they gave us the option, and also this was brunch. Perfectly fried, moist rabbit (and keeping rabbit moist can be tough!). Pops of sweet corn and bright tomato. Nice bitter greens, still with a bit of chew. And a smoky, creamy hollandaise to round everything out. This was a great dish. I'm glad that the other main we ordered was a salad, because the rabbit was very rich. 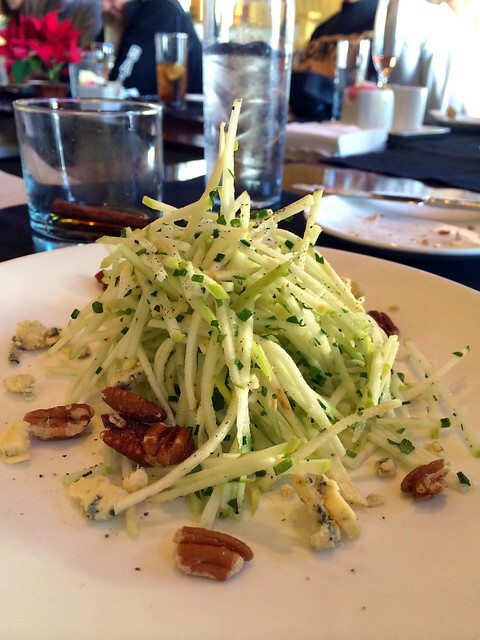 The crunchy, sweet/sour apple and celeriac slaw with pecans and blue cheese was a really nice accompaniment, and we happily passed plates back and forth. The drinks we tried were all top-notch, as well. We had a brandy milk punch and a couple of cocktails. Logan tried a twist on an Aviation called the Delayed Departure, made with genever, and I had a cinnamon-spiced dark drink that isn't on the menu any more, whoops. It was good. So, yeah, La Petite Grocery was all-around outstanding. The service was professional and friendly, the food was all wonderful, and the place is so adorably New Orleans. I hope someday Austin can aspire to New Orleans's level of food, but it generally doesn't seem to be happening. Dangit. On a blog-keeping note, WHAT THE EFF, why aren't Flickr and Typepad playing nice together any more? My pics don't show up in preview like they used to. Apparently it's Flickr's new embed code, along with the fact that Typepad appears to have had no updates since like 2008. Grr. 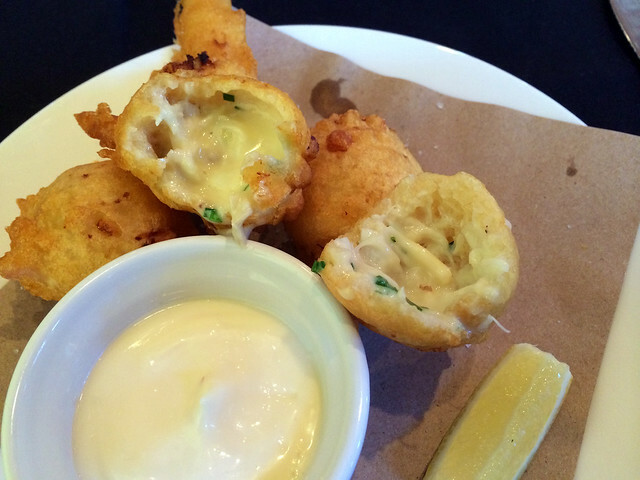 Oh my gosh, you had me at blue crab beignets! La Petite Grocery has been on my NOLA to try list for a while, and you have moved it to the top. Looks like a delicious brunch. Congrats on 9 years of blogging! I'd highly recommend La Petite Grocery! But, as you know, there are so! many! wonderful places to eat in New Orleans! It's always hard to choose.